Out on UK Blu-Ray, DVD and Digital this week from Arrow films, a man found left for dead, finds his past catching up with him in The Mo Brother’s extremely bloody action film "Headshot". Set in Indonesia, a man (Iko Uwais - The Raid) is taken to hospital, after being found close to death. having been washed up on a beach, with a gunshot wound to his head. Nicknamed Ishmail by the hospital staff, he spends several months in a coma, before eventually recovering, although as he is unable to remember who he is. But, no sooner is he back on his feet, he finds himself being hunted down by a ruthless crime boss and his gang of psychopaths. However, he also discovers he has somehow acquired a lot of very deadly skills, and a series of virtual non-stop shoot-outs and martial arts fights ensues. 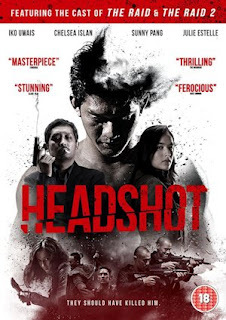 Directed by the Mo Brothers (Killers, Macabre), “Headshot” is an action packed, brutally bloody violent thriller (including an absolutely outrageous prison break scene at the start). If you try to imagine what the Jason Bourne films would look like if John Woo had made them, that is Headshot. I will say that I was a little confused by the language continually switching between Indonesian and English and perhaps the ending dragged on a little longer than it should. I was also a little disappointed that the DVD I was sent to review did not contain anything in the way of extra features, aside from a couple of trailers for other Arrow titles. But the film is still one hell of a high octane thrill ride, if you liked The Raid, you’ll love this. So if you’re not bothered about supplemental features (or you prefer to watch this stuff on Netflix) you should definitely check this one out.